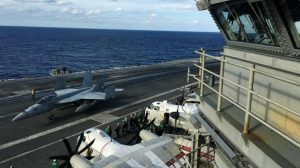 U.S. fighter jets darted over the Western Pacific on Saturday as the nuclear powered USS Ronald Reagan aircraft carrier joined Japanese destroyers and a Canadian warship for the biggest combat readiness war game. This is a war game ever stayed in and around Japan. Japan and the United States have mobilized 57,000 sailors, marines and airmen for the biennial Keen Sword exercise, 11,000 more than in 2016. There are also simulated air combat, amphibious landings and ballistic missile defense drills. “We are here to stabilize, and preserve our capability should it be needed. 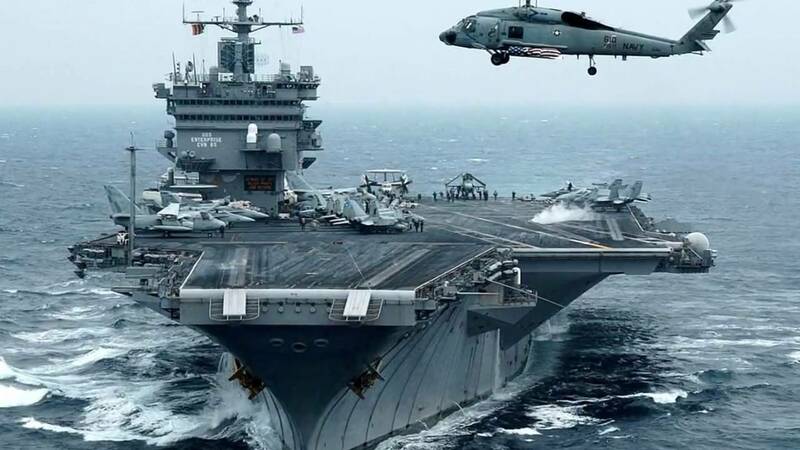 ”Exercises like Keen Sword are exactly the kind of thing we need to do,” Rear Admiral Karl Thomas, the commander of the carrier strike group, said. He made the statement during a press briefing in the Reagan’s focsle as F-18 fighter jets catapulted off the flight deck above him. “The U.S.-Japan alliance is essential for stability in this region and the wider Indo Pacific,” Rear Admiral Hiroshi Egawa, the commander of the Japanese ships said aboard the Reagan. Canadian participation is taking a bilateral drill which began in 1986 “into the realm of multilateral exercises,” Canada’s defense attache in Japan, Captain Hugues Canuel said in Tokyo. At the same time, Japanese Prime Minister Shinzo Abe, has engaged China in dialogue to reduce tension between their militaries in the East China Sea and to increase economic cooperation between Asia’s two leading economies. Amid a background of trade friction with Washington, Abe last month traveled to Beijing, the first such trip by a Japanese leader in seven years, for talks with President Xi Jinping and Premier Li Keqiang. Abe told them that China and Japan shared responsibility for regional security, including tackling North Korea. Japan, however, still views China as a potentially much larger and more challenging foe than Pyongyang as its expanding navy consolidates control of the South China Sea . The navy ventures deeper into the Western Pacific and Indian Ocean. Beijing this year plans to spend 1.11 trillion yuan (160 billion dollars) on its armed forces. This is more than three times as much as Japan and about a third of what the U.S. pays for a military that helps defend the Japanese islands. Keen Sword “remains an expression of the commitment of like minded allies and partners.